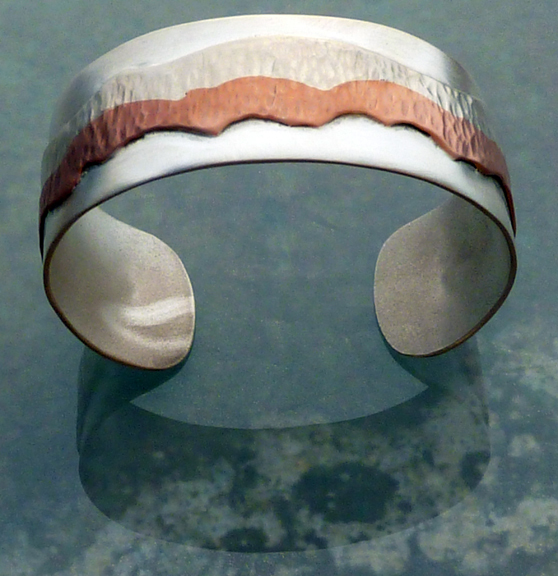 Hand-hammered cuff with a raised and textured copper and silver free-form band create this substantial married metals cuff. Inspired by the Red Rock mountain landscape where I grew up. May be worn low on the wrist like a bangle, or higher up near the wrist bone. Signed on the inside. This is a one-of-a-kind piece, entirely hand-crafted. Edges are rounded on the inner rim for a comfortable fit.